A garden tea party is usually a semi-formal event that’s fun for food, the weather and what to wear. Warm days and comfortable cool evenings make the right atmosphere for a lush garden tea party. It is also the perfect weather for the chic smart casual dressing tea parties require. 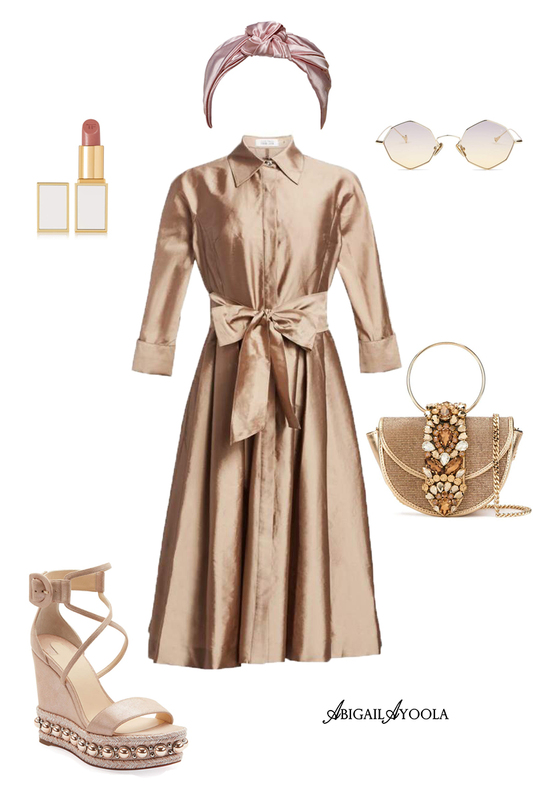 This outfit edit serves as style inspiration if you’re preparing a look for an upcoming garden tea party or looking for what to wear to a semi-formal event. Fabulous spring garden parties are also used for many other celebrations that you may attend. Including beautiful baby and bridal showers, Easter parties, Mother’s Day brunch, and Birthdays. A shirt dress is the perfect combination of smart and playful and its versatility is amazing. It has the ability to be more causal in a cotton or lighter fabric, even depending on the skirt length. By selecting a silk finish and metallic colour as in this case, it provides a more lustrous appeal. When it comes to garden party footwear, wedges will be your best friend. And there is no need to settle for bulky flat brick-like options. Choosing beautifully shaped wedge heels with some statement detailing and a flattering silhouette will serve you well. As the spring theme of a garden tea party will usually revolve around florals and pretty light colours, your outfit colours are important. As one who loves a good all black outfit, it pains me to say no black outfits allowed. For colour codes, think florals, metallics, pastels, pinks, whites and earth tones. For accessories, a pretty hat is a lovely accessory welcomed at tea parties. Rather, if you find hats too stuffy, try the contemporary style option of a statement headband instead. Be sure to keep your jewellery demure, classy and simple. Lastly, don’t forget your sunglasses.